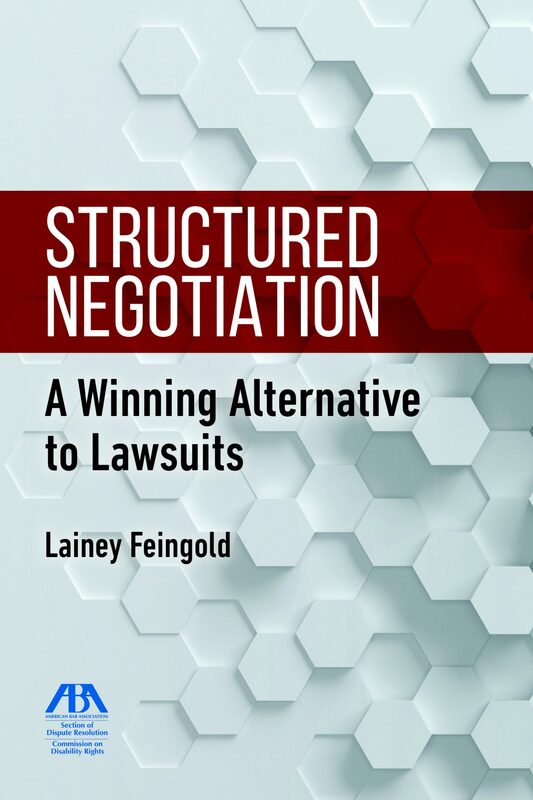 As one of America’s leading civil rights lawyers, Lainey Feingold uses Structured Negotiation to obtain far-reaching settlements without litigation. Now she shares her secrets. This book should be required reading for lawyers and law students alike. From Walmart to Major League Baseball to the City and County of San Francisco, Lainey Feingold, her clients and co-counsel have convinced some of the nation’s largest organizations to deliver far reaching results. How she accomplished this without filing a single lawsuit is now the subject of a path-breaking new book. Titled Structured Negotiation, a Winning Alternative to Lawsuits, the book is a nuts and bolts guide for attorneys and advocates in all fields who want an effective new strategy to resolve legal claims. For readers with print disabilities, the Structured Negotiation book is available on Bookshare. Please contact us if you would like to be notified about book-related events and behind-the-scenes articles about the stories and issues in the book. Why are there hexagons on the book cover? The Simplified Summary of this Document, a feature of LFLegal.com designed to meet WCAG Success Criteria 3.1.5 (a WCAG 2.0 AAA Reading Level requirement). Structured Negotiation is a dispute resolution method. It was developed by Lainey Feingold and civil rights lawyer Linda Dardarian to resolve technology and information access claims of the blind community. With the book’s publication, the dispute resolution process is now available to lawyers and advocates in other practice areas who want a legal strategy that focuses on solution and avoids the high-stress, high-conflict and high-cost of litigation. A winning lawsuit alternative, Structured Negotiation delivers results. Its framework is premised on the idea that legal claims can be resolved equitably — and cost effectively — if stakeholders are able to form relationships and communicate openly with each other. Structured Negotiation avoids depositions and expert battles. Instead, it is a dispute resolution method built on the collaborative notion that if parties seek common ground, instead of digging their heels into legal arguments, solutions to even complex problems can emerge. Lawsuits play an important role in moving society forward. But filing a complaint should not be the only option for claims resolution. The legal profession — and the public it serves — deserve alternatives that are less costly, less stressful, and more cooperative. Clients need a forum where their stories matter and where they can be — and feel — heard. Champions in the public and private sector need a dispute resolution process that allows them to do the right thing without having to first prove there is no problem to begin with. In an engaging and easy-to-read style, laced with examples from twenty years of Structured Negotiation, Lainey’s new book gives readers another set of tools. A blind lawyer whose insistence on accessing ATMs independently led to successful Structured Negotiations about Talking ATMs with most of the largest financial institutions in the United States. Pharmacy customers who cannot read standard print prescription labels and the national pharmacies — including Walmart, Walgreens and CVS — who worked with them in Structured Negotiation to find a solution. Structured Negotiation empowers advocates, giving them a place at the table and a voice in the conversation. And it encourages corporate and government champions to do the right thing. Here is a sample of the praise Lainey’s Structured Negotiation book has received. Read all posted feedback about the book here. This fantastic guide to structured negotiations provides valuable insights for anyone interested in becoming a better advocate. Readers learn effective strategies through easy-to-follow explanations with fascinating anecdotes from the author’s work as a disability rights attorney. I really enjoyed reading this book and appreciate all the lessons within. If you are a lawyer, an advocate or a person who would like to learn how to reduce conflict in situations where people share vastly different perspectives, you’ve got to read this book. What a great resource – packed with useful information, legalese made readable, and it shares valuable insights on the way digital accessibility is (mis)understood by those outside our community of advocates and consumers. If you care about equal access to communications technology, get the book, read it, and share it widely. It will help you talk about a complex issue directly and positively. Read more praise about the Structured Negotiation book. Why are there Hexagons on the cover of the book? The Structured Negotiation book cover has a background of 3-D white and gray hexagons. Who knew that a hexagon was the perfect shape for a book about a cooperative and effective way to resolve disputes?! Read the post about hexagons on the cover of the book. Read more excerpts from the Structured Negotiation book. How to write an opening letter that invites participation. The only tone in a complaint is we’re right, you are wrong. The Structured Negotiation opening letter is different. Think of it as an invitation to negotiate. How to establish a ground rules document that all parties sign at the beginning of the relationship. How to draft the settlement document using strategies designed to get past fear that can obstruct resolution — and When to bring in a mediator or even file a settlement in court. How Structured Negotiation settlements are monitored and enforced, ensuring commitments are met.